China has begun fueling the rocket that will launch three astronauts into space Saturday on a mission to carry out the nation's first manned space docking, according to media reports. China’s Shenzhou 9 spacecraft is slated to blast off atop a Long March 2F rocket Saturday (June 16) at 6:37 p.m. Beijing time (6:37 a.m. EDT; 1037 GMT), China's Xinhua news agency reported. Once in orbit, Shenzhou 9 will attempt to link up with the Tiangong 1 prototype space lab, whose altitude has been lowered to accommodate the manned rendezvous and docking. Tiangong 1, whose name translates as "Heavenly Palace," was hurled into orbit in September 2011. Two months later, the unmanned Shenzhou 8 vehicle pulled off China's first-ever space docking, hooking up with the space lab two separate times. China’s astronauts for the upcoming flight are Jing Haipeng, Liu Wang and Liu Yang, who is poised to become China's first female spaceflyer. She is a married 33-year-old who joined China's air force in 1997. Liu Yang is a veteran pilot with 1,680 hours of flying experience, and she served as deputy head of a People’s Liberation Army (PLA) flight unit before being recruited as a prospective astronaut in May 2010. The crew of China's Shenzhou-9 mission, set to launch in June 2012, waves. L to R, Liu Yang (China's first female astronaut), Jing Haipeng, Liu Wang. The Shenzhou 9 liftoff also marks another milestone. 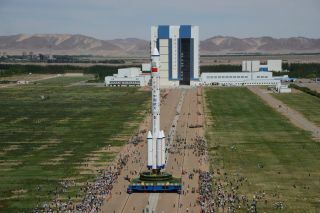 It will be the first time that the Jiuquan Satellite Launch Center, located in the Gobi desert, conducts a mission in the summer months. The past nine spacecraft lofted by China’s manned space program were launched in the spring, autumn or winter. The country's three previous manned spaceflights all blasted off in autumn. The Shenzhou 5 spacecraft carrying China’s first spaceflyer, Yang Liwei, lifted off on Oct 15, 2003. Shenzhou 6, which carried two taikonauts, went into orbit on Oct. 12, 2005. Shenzhou 7 ferried three taikonauts into space on Sept 25, 2008. "The high temperature of the summer poses a challenge for us to guarantee the stability of propellant, especially if the launch is to be delayed," Cui said, according to the newspaper China Daily. Rocket technicians have drafted plans on how best to store the fuel on hot days and how to unload the propellant safely in emergencies, he added. China's ambitious human-spaceflight plans extend well beyond Saturday's launch. For example, the manned Shenzhou 10 spacecraft will be launched by the end of this year, according to Jiao Weixin from the School of Earth and Space Sciences at Peking University. As reported by the Taiwan-based news site Want China Times, Jiao said that two more space modules — Tiangong 2 and Tiangong 3 — will be launched between 2014 and 2018. Gregory Kulacki, a senior analyst for the Union of Concerned Scientists, has noted that the upcoming docking mission is an intermediate step in China’s plan to build a space station. China’s future space station will be significantly smaller than the International Space Station, Kulacki observed in a new study. Although China has not yet approved a final design and has many technical decisions to make, Kulacki said, some Chinese program planners estimate the space station will weigh 60 to 80 metric tons, which is five to six times lighter than the International Space Station. Chinese officials have said they hope to build the station by 2020, and to put taikonauts on the moon sometime after that.